Google encouraged third party developers to find and report security bugs or flaws on its one and a half year old browser, Chrome. They will give out $500 to $1337 cash rewards for those who could find and immediately report these security flaws before hackers and malware writers use them in their evil deeds. developers who could find security holes on their famous browser, Firefox. As expected, Avatar indeed sunk the once seemingly unsinkable record of the 1997 blockbuster movie Titanic. James Cameron is really “the King of the world” by beating his own record. He has proven himself to be a real genius in Hollywood. Fox estimates the latest earning of Avatar to be $1.844 Billion sinking Titanic’s $1.843 Billion 13 years ago. The gap will further increase considering that Avatar is only on its 7th week of showing while Titanic made the record over 10 months. This revolutionary sci-fi movie features the story of an initially reluctant ex-marine (Jake Sully played by Sam Worthington) that turns out to be the hero of the blue-skin tribe called Na’vi in the alien world of Pandora. The movie is revolutionary in the sense that it features a new way of combining computer generated environment while capturing the motion and emotion of the real actors. There is no doubt that social networking sites have been an integral part of the lives of Filipinos. Facebook, Friendster, Twitter and Multiply were becoming common household terms. Alexa, an internet analysis website reported that in the Philippines, Facebook is the website with the highest traffic. And among the top ten websites, six were classified under Social Networking. I remember a few years back when Friendster is gaining popularity. My friend taught me how to create an account and invite friends. Then, the video sharing website You Tube took the center stage. And now, Facebook seems to have won the hearts of Filipinos with their cool applications, most notably, Farmville. Microblogging sensation Twitter is also gaining popularity. The dramatic increase in the popularity of these websites is viral. And it’s all because these websites are designed to facilitate faster exchange of information. Avatar: 6th Week on Top and Bound to Overtake Titanic! James Cameron’s latest blockbuster creation, Avatar is still the number one movie in the US box office on its sixth week after its worldwide opening last December 18, 1009. The movie earned $36 million, a small drop from its previous week’s earning, $41 million. It already grossed an accumulated earning of $553 Million in the United States beating Dark Knight’s record of 533 Million placing the film on the second spot of all-time highest grossing film in the country (Titanic is in a close distance at $601 Million). It seems that Titanic, the world’s highest grossing film of all time, and also the last film made by Cameron is bound to sink again! Avatar’s record is looming to overtake the 1997 blockbuster. News Corp division and producer of Avatar, 20th Century Fox estimates that the epic 3D blockbuster has already grossed a stunning $1.841 billion worldwide, very close to Titanic’s record of 1.85 Million. If you think Avatar is just a simple animated movie, well, think again! A totally different way of making movie was introduced by James Cameron in this blockbuster film. Avatar is far more than a simple animated movie where the actors just stand up in front of the microphone, dub all the voices and all else is computer generated. Avatar is a revolutionary movie in such a way that it combines the digital world to the real actors. All the motions and emotions are genuine. When the characters jump, the actors really jump. The fight scenes are really made by the actors, not by computers. How did James Cameron do it? Watch this video below. Browser Updates: Firefox 3.6 and Internet Explorer Fix! 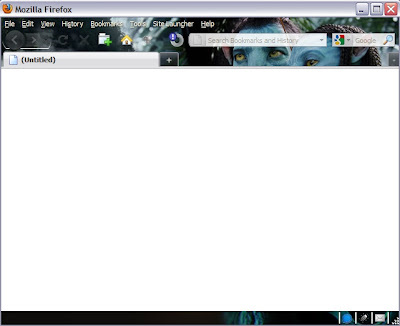 Firefox 3.6 is already available for download! Firefox 3.6 is the latest released version of the popular browser by the open source advocate Mozilla.org. Firefox 3.6 has several major improvements over its predecessor, Firefox 3.5. Most notable of these is the official incorporation of the Personas, a former Firefox add-on that customizes the look and feel of your browser. You can now change your browser looks in just a single click on the mouse. See the screenshot of my Avatar theme below. Personas theme gallery are available at www.getpersonas.com. Early tests showed improvements in performance comparable to Google Chrome 2.0 but still behind the fastest browser today, Google Chrome 3.0. Firefox 3.6 also improved the support for the emerging HTML 5 standard. Inflation is the rise in the prices of goods and services in a country. It is translated to the decrease in the purchasing power of a currency. For example, your 500 pesos now can only buy 80% of what it can buy last year. Having a piggy bank is what most people do to save money. But unfortunately, your money inside it will be eaten wholly by Philippine’s high inflation rate. Saving for long term in a piggy bank or under your bed sheet is simply outdated and impractical nowadays. The news about the alleged “limitation” on the showing of blockbuster movie Avatar by the Chinese regulators quickly spread on the internet. According to it, the Chinese authorities are planning to shut down the showing of the 2D version of the film. This quickly spurred annoyance to the Chinese moviegoers. They argue that the movie “came in late” so there’s no reason to limit its showing as early as now. Some movie theaters confirmed that they received an order to stop showing the movie on their screens. One Chinese regulator defends the alleged “limitation” saying that it is only natural since the 3D and IMAX versions are more popular, so the 2D versions will close earlier. Many people doubted this reason. Instead, they believe that this “stoppage” was intentional to make way for the showing of the movie about Confucius, a Chinese philosopher and teacher, which will be portrayed by Chow Yun-fat. The movie about Confucius will be out by the end of this week. Did you participate in PayPal’slast promo in Asia, the PayPal Wish list on Facebook? We’ll if you did, you should’ve already got an email from them regarding your cash rewards. I received a notification yesterday that the cash will be transferred to my account soon. And this morning, I received again another notification saying that the money is already in my account. I immediately checked my PayPal account, and viola! Seven dollars are added to my PayPal fund! Instant cash just by referring the promo to your Facebook friends! PayPal Wish list is a promo from PayPal that officially started December 16, 2009 and ended by December 31, 2009. This promo is only available on selected countries in Asia (India, Thailand, Malaysia, Korea, Vietnam, Philippines, Indonesia or Singapore). The hackers attacked again! This time though, not on a government owned website, but in a commercial one. CD-R king, one of the Philippines most popular retailer of computer and electronic accessories, was target of the latest attack. Their “new products” webpage was defaced by the hackers. 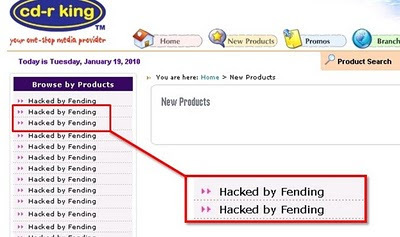 All the names of their new product offerings were replaced by the words “Hacked by Fending”. Below is the image of the defaced CD-R King website. This attack just one among the series of hacker attacks targeted on Philippine websites. Late last year and early January, 2010, a number of government websiteswere also defaced by hacker groups. TESDA, DOH, DOLE and NDCCs websites were among them. The revolutionary 3D film by James Cameron, Avatar, is still on top of the US box office and shows no sign of slowing down. Avatar garnered a record breaking of 41.3 million dollars of earnings on its fifth week even surpassing the newly released “Book of Eli”. It already accumulated 492 Million dollars on US box office knocking Star Wars on the third highest grossing film in the United States. Worldwide, the film already reach more than 1.6 billion dollars and many people predicts that two weeks more, it will overtake Titanic (1.85 Billion) as the world highest grossing film of all time. In response to Google's announcement that they will stop censoring search results on their Google.cn website after series of hacker attacks, China's Foreign Ministry spokeswoman Jiang Yu said that the country's internet is open and international companies are welcome as long as they obey the law. After what the company described as "highly sophisticated and targeted attack on our corporate infrastructure", Google finally decided to end its obedience to China's policy on web censorship. And if forced, they threatened to leave the country and close all of its offices. The attacks were targeted on Google's email service Gmail. The hackers attempted to access the Gmail accounts of known Human Rights activists that are protesting against China's suppression of what they believe as Freedom of Speech. The attack failed to see the content of the victim’s emails, but had penetrated Google infrastructure and were able to see up to the Subject line of the emails and the date of the account creation. Watch Avatar movie trailer from you tube below. James Cameron is a genius! Avatar is probably one of the greatest movies of all time. A typical story but presented in a captivating manner. It is a story about imperialism with the main character changing his principles and fighting for the people he once ought to fight. It’s like Disney’s Pocahontas. With the combined power of technology and superb direction, you will be taken out of Earth and enter the world of Pandora. The green lushes of rainforest, the floating mountains, the bioluminescent fauna and flora, and the Na’vi people that live in harmony with nature. What I like most in the story is that it touches the viewer’s hearts and makes us feel what the characters felt. It also made us humans, guilty of what we are doing with our environment. We keep on doing our selfish deeds and ends up destroying our nature. The Na’vi people are the example to imitate. TESDA. Image via Wikipedia There have been seven consecutive hacker attacks on Philippine Government websites since December 2009. The latest was on Technical Education and Skills Development Authority (TESDA) website, www.tesda.gov.ph. This morning, TESDA website was defaced with an image of a man casting a dirty finger in the air and asking in English: “What will be used in the election? “. It obviously pertains to the coming Philippine election on May 10 this year which is planned to be automated. 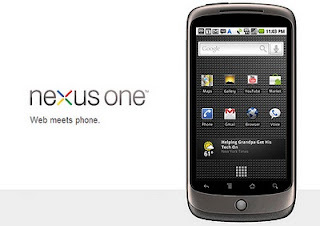 Search engine and online advertising giant, Google Inc, finally unveiled its highly anticipated smart phone, the Nexus One. Image by http://www.flickr.com/photos/abulhussain/ / CC BY 2.0 Operating in Google's open source software platform, Android, Nexus One is often tagged as a Droid Plus because of its similarity to the Motorola Droid that was released last year. Unlike Motorola Droid though, Nexus One does not have hard buttons but simply relies on touch screen keyboard like its rival, iPhone.